Editor’s Note:The following excerpt reproduces the basic cross stitch directions provided at the beginning of Priscilla Color Cross Stitch Books One and Two. We have also reprinted the original suggestions and full color Cross Stitch plates available in these books, which were first published in 1912. Please see Priscilla Cross Stitch – Book No. 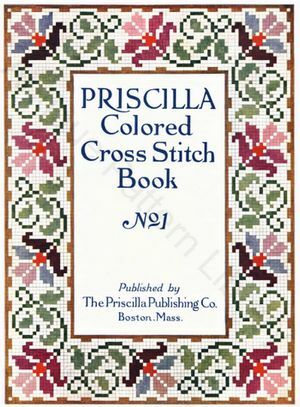 1 and Priscilla Cross Stitch – Book No. 2 to access the four full-sized color charts. Cross-stitch Embroidery may be done on any fabric which has a regular square weave – which has the same number of threads to the inch both ways – provided the threads are heavy enough or far enough apart to be easily counted. Among the most popular materials for this work are scrim, Aida canvas, Mosaic canvas, Hardanger cloth, Java canvas, and Penelope canvas. Some of these are much coarser than others, consequently the design will appear larger on the coarse than on the fabrics of fine weave, and necessarily this must be taken into consideration when selecting the pattern. The Penelope canvas, being of a very loose, open weave, is often used simply as a guide for cross-stitch on plain linens or other fabrics which are not naturally suitable for the work. This is done by basting the canvas on the linen, then working over the canvas and through the linen, using the regular weave merely as a guide. After the work is finished, the threads of the canvas are drawn out one by one, leaving the design embroidered on the linen. This method is especially useful in embroidering hand towels, it is also used on velvet and cloth and other similar fabrics, which could not possibly be worked on the weave. In selecting thread for cross-stitch, the mesh of the fabric determines the size of the thread. It should be coarse enough to fill the space nicely without overcrowding and pushing the threads out of place. Silk, cotton, linen thread and crewel, are all used for cross-stitch, depending upon the purpose for which the article is to be used, and again upon the fabric. A needle just large enough to carry the thread easily should be used, preferably one with a blunt point, which will pass through the meshes without sticking into the threads. All the top stitches in Cross-stitch Embroidery should have the same direction, as this gives a uniform and pleasing appearance to the work which cannot be gained otherwise. Do not tie knots in the thread; simply bring the needle through to the right side, leaving about an inch of thread on the under side which is held in place with the finger of the left hand until is worked over by several stitches as the cross-stitch proceeds. This secures the thread sufficiently so that it will not pull out. It will be found easier, in ordinary cross-stitch, to make the stiches in one direction entirely across the row, then go back, putting in the top stitches, rather to complete one cross separately. Of course,this applies to designs in which masses or lines of color appear and not to individual separate spots, these necessarily must be completed one at a time. Sometimes, in commencing a new row, it will be found more convenient to make the top half of the cross first, then pass the thread under this for the other stitch. The easiest and best ways of overcoming many little problems will be learned by the worker as the difficulties occur. In passing from one spot to another where the spaces are not too far apart, it is not necessary to fasten off the thread, but where possible it is better to run the needle under stitches which have already been taken and not have any long, loose threads on the wrong side. In plain cross-stitch, two threads crossed at right angles complete the stitch, but on some fabrics which have an especially large weave, as the Mosaic canvas or Berlin canvas, it is necessary, to get a close effect, to fill in the space with four stitches instead of two, letting them cross at the centre and having two shorter than the others, the whole forming a square. This double cross is called the Leviathan stitch; it really gives the impression of a star. It is particularly pleasing on Mosaic canvas, which has a heavy thread separating it into one-quarter-inch squares. These threads are left uncovered and appear as white lines through the design, separating the individual squares in Mosaic effect. Often, combined with cross-stitch, the Holbein stitch is used to give a more delicate appearance. This is a single stitch used either diagonally or with the weave of the canvas as the design may demand. Sometimes these single lines entirely enclose a square, which may be left open or filled with a cross.